It’s a good idea to declutter your workspace and get your office in order from time to time. Fortunately, Business Management Daily is offering our Office Organization Documents: 5 essential forms to help you attain an organized and productive work life FREE. With these documents, you’ll have the tools you need to become more efficient, engage in effective planning and eliminate disorganization at work. They’ll enable you to optimize productivity and keep your office operations running smoothly. Yes! Send me the FREE Documents! 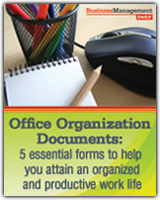 These documents are printable, and easy to fill out with your organization’s information and keep on file.